I suppose no one cared that Candy and I explored the hills and timbers just to listen to the quiet of the countryside or to conjure up daydreams of mountains, forts and castles. I usually rode through town as quickly as I could. If I were going to be a horse lover, I did not want to be confronted with people who did not understand me. Then, one summer, I learned how wrong I was about the opinion of my hometown, and I found that the harshest judgment was coming from me. Candy, that particular summer, was the size of a large pony but not yet tall enough to be called a horse. I knew that because I measured her height often to see when she would reach the official height of a horse. She was a palomino paint horse, and I was very proud to tell everyone that she was one quarter American Saddlebred. It had taken me two years to save enough money to buy her as a weanling, and I spent countless hours training her to be a good pleasure horse. She was gentle and obedient, but most of all she was a good companion. Since that particular day was hot and muggy, I rode after dinner when it was cooler. I had already decided to ride down an abandoned road outside of town. The trail I had in mind led across a wooden bridge and into the hills I wanted to explore. Passing through the streets of town, I spotted townspeople here and there in their lawns or on their porches. I saw the town’s state policeman, “Moon” Mullens, and several of his friends gathered around a Jeep and a couple of patrol cars. I smiled to see such a gathering of law officers in town since occasional stray livestock or a flat tire were the biggest events for weeks at a time. As I neared the edge of town, I passed the house where Mr. Bess, an old man in faded overalls, stood in his yard and watched me pass. I smiled quickly in his direction, but he just spit a stream of tobacco juice in the grass. His dog was more enthusiastic in greeting me, nipping at Candy’s heels and barking constant protests. I urged the horse to a jog and moved away from that yard and onto the dirt road. 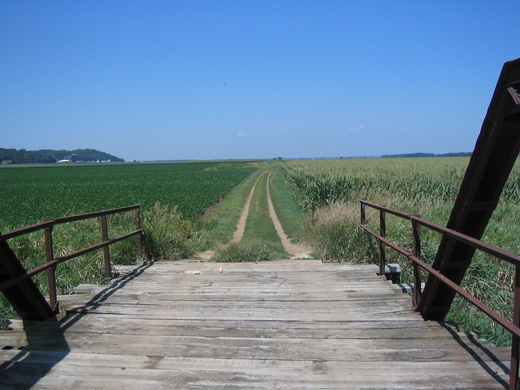 When I reached the old wooden bridge, I dismounted to lead Candy across. She was very trusting, and as I coaxed her onto the floor boards, she followed without hesitation. But halfway across, I could see that we were in trouble. Someone had shifted the planks on the bridge, and the gaps were big enough for Candy to step in. In fact, they were big enough to drop a basketball through. I looked behind Candy and saw that if she turned around on the bridge, her hooves could easily slip into gaps between the planks behind her and perhaps create a hole big enough for her to fall completely through the bridge. I thought out loud, partly to calm myself and party from my habit of including the horse in my own conversation. “What’ll do?” I knew I was in a predicament caused by my own stupidity. The sensible approach would have been to check out the bridge before I had even begun to cross. “We can’t very well go on across because they we’ll be stranded on the other side with no road out. And I’m not going to yell for help because we don’t really need help yet.” I looked around for spare boards and saw only the creek, 40 feet below, gurgling over rocks and snags. I decided to turn Candy around one step at a time. But after one unsteady step, she sensed my nervousness, backed up another step and placed her foot into a hole! Her left hind leg was through the bridge, and I grabbed the bridle and began to pull. As Candy tried to strain forward, her other hind leg hit the same gap, and she landed hard on the surface of the bridge. I was terrified and tried to help her up, but with nothing to support her hind feet, Candy’s efforts were useless. I stopped pulling, afraid our efforts would widen the hole on the bridge and Candy would fall to the rocks below. She rested quietly on the bridge, and a slow creep of blood came from her hip. I felt like crying, but I knew I was in serious trouble. My biggest fear was that my pony would have to be destroyed, and if that happened, I knew I could never forgive myself. “Keep calm. Keep calm,” I whispered nervously. Then, comically, I remembered that I should try to soothe the horse so she would not sense my fright. As helpless as she was, Candy remained quiet and still, with her front feet propped on the bridge. I patted her nose and spoke softly to her. “Don’t move,” I said, as if she had a choice. Then I stood there and screamed at the top of my lungs: “Somebody help me!” I shouted toward town even though the houses were more than a quarter mile away. I prayed someone would hear me since I dared not leave the bridge. “Help me!” I yelled again. I could faintly hear only a lawn mower in the distance. “Where are you?” someone yelled back. “I’m down here on the bridge. My horse fell through.” It was not exactly what I wanted to say, but I could not explain the details at that volume. I heard a car engine roar to life and watched as a Jeep sped down the street. Two police cars followed, one with a siren and flashing lights. I could see people spilling out into their yards and cars and trucks spilling out of the town onto the dirt road leading to the bridge. “Oh, sure!” he said, exaggerating the ease of the matter. The state trooper and county deputy arrived, and I looked pretty sheepish as a crowd began to gather. I recognized the faces of many townspeople as they emptied out of cars and trudged toward the bridge. As worried as I was about my horse, I was still dreading the scolding I deserved for being so careless. I looked down the road and saw that it was jammed with cars all the way back to town. I recognized my dad’s Ford parked in the line. As he walked toward the scene, I could see the concern in his face, but no lecture was given. Instead, Dad patted me on the shoulder and turned his attention to the horse on the bridge. In the midst of all this commotion, Candy remained calm. About a dozen men stood around her and debated suggestions for freeing the horse. I squirmed at the idea of fetching a crane to lift Candy, but that idea led to another, more promising approach. The deputy brought a blanket from the trunk of his car, and several hands worked to push one end under the horse’s belly and pull it to the other side. “On the count of three,” Dad said, “we’ll lift her up, and some of you others slide the boards back under her feet.” They strained a few long seconds and slowly lifted her up from the hole. I looked down and saw an iron beam beneath the boards. Candy’s legs had gone on either side of it, and she had been supported by it the whole time. Her cut was a minor scrape, and her legs, although they shook for a second, were undamaged. I heaved a big sigh as we walked off the bridge together. I was red with embarrassment, but I could not stop smiling. I knew Candy was going to be all right when I saw her bury her nose in the first clump of grass she saw. Almost immediately, tears welled up inside me, and as the drops rolled down my cheeks, I hid my face in Candy’s mane. When I looked up at the crowd around me, I saw only smiles of reassurance and understanding nods. The townspeople clapped each other on their backs and turned to walk to their cars. One or two stopped to pat me on the arm or say a kind word, and I just nodded, unable to say the words of thanks I felt in my heart. I walked beside Candy all the way home because I could not bring myself to ask her to carry me after such an ordeal. Although we never did cross that bridge, Candy had carried me into the hearts of everyone who helped us that day. For the next few weeks, I was as close to being a celebrity as one can get in a small town. 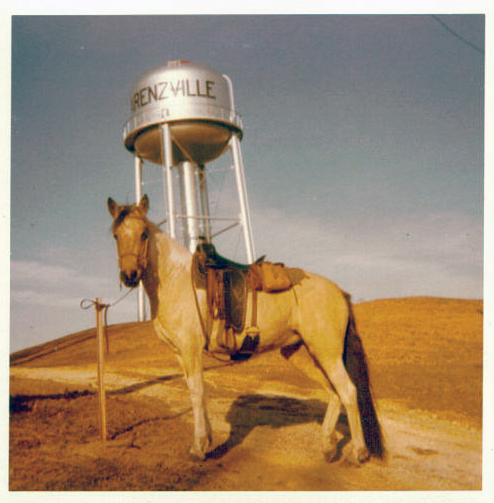 One day later that summer, I rode again through Arenzville, this time with completely different feelings for the people who turned to watch. I started down a side street and saw Mr. Bess out strolling in his lawn. He looked up at me and very deliberately turned to shut his dog in a pen. Then he wandered over to the sidewalk and spoke to me in a droll tone. “Goin’ down to the bridge?” he asked. Kids respond to Candy's story.